British Telecom Group (BT) is a multinational telecommunications services company dealing in TV, fibre, fixed and mobile primarily in UK and across 180 countries globally. The company was established in 1969 and is headquartered in London, UK and has around 102,000 employees as of 2016. It was born out of the General Post Office in 1981 when it became independent and became known as British Telecommunications trading as British Telecom. It was privatized in 1984, with approximately 50% of its shares sold to public. The government sold its remaining stake further in 1991 and 1993. BT features on both the London Stock Exchange and New York Stock Exchange and is also a part of Footsie. Both subsidiaries, 'BT Global Services' which oversees telecom services to corporate and government bodies globally and 'BT Consumer' which supplies telephone, broadband and subscription services across United Kingdom are controlled by British Telecom. BT's businesses are sternly regulated by Britain's telecom regulator Ofcom. BT is gradually diversifying into information technology and digital products which are more profitable and has lesser regulation. British Telecom's USP (unique selling proposition) lies in its being a legacy, one of the world's oldest telecom company with a global presence. BT group's mission statement reads "Our mission revolves around a total dedication to the quality of service and experience our customers receive from us: BT Retail is a customer-centric distribution business that will grow shareholder value and deliver an excellent, continuously improving, customer experience." The major shareholders of BT as of 31 March 2017 include: BlackRock with 5.50% of total voting rights, T-Mobile Holdings Limited with 12% of total voting rights and Orange SA and Orange Telecommunications Group Limited representing 4% of total voting rights. The SWOT analysis report of British Telecom presents the internal analysis and external analysis of the Company with insightful details of the current market position and future growth strategy of UK's most popular telecom player. The SWOT analysis essays the detailed business case of British Telecom with insights into its strengths, weaknesses, opportunities and threats. 1. Healthy balance sheet with strong financials and cash flow from operations: : British Telecom has a healthy balance sheet with strong financials. Its FY16 revenues stood at £19,042 million; up 5.9% from £17,979 in FY15. Its FY16 operating profit stood at £ 2588 million up 21.21% from £2135 million in FY15. It has a net asset base of £31,576 million as on 31st March 2016. BT also had strong cash flows of £18,909 million in FY 2016 from external customers, which is a 5.9% increase over the previous year. Given situations where many companies don’t have the cash to meet their day to day obligations, BT's business model ensures there is a strong cash flow which is indicative of the Company's ability to adequately meet its working capital obligations. 2. Strong base in UK with large number of customers: BT Group is the largest provider of consumer broadband and fixed voice telephony in the UK. They acquired the mobile operator EE in January 2016. This has landed BT 35% of the mobile consumer market share and a similar share of the UK's consumer broadband business. This has put them in a better position to meet the demands of UK’s customers. More than 560 communication providers use their network. BT's operations are spread across 3 target markets, business, consumer, and infrastructure. The consumer market, consisting of households, is catered to by providing fixed-line broadband and telephony services; the business market consists of 5.4 million businesses in the UK, and the infrastructure market includes firms building network infrastructure, data centers and mobile cell sites, where Ethernet connections and specialized services are the main areas of demand. 3. Wide spectrum of product and service offerings: BT has 6 customer facing business portfolios, Consumer, EE, Business and Public Sector, Global Services, Wholesale and Ventures, and Openreach, which will now be an independent unit but will be 100% owned by BT. They are the biggest provider of fixed line telephony and broadband services in the UK. They are also the second largest provider of Pay-TV sports channels and a leader in broadcasting technology. BT Broadband has approx. 5.83 million customers in UK (comprising North Ireland, Scotland, Wales, and England). BT's offerings range from Broadband, TV, Sports, fixed –lines, mobile and bundles. BT is one of the leading networked IT service provider to global and domestic multinationals in India. 4. Delivering strong customer experience through great product and services: British Telecom has consistently emphasized on its strategy to improve and deliver every aspect of its customer experience. Initiatives undertaken by BT to improve customer service include weather proofing of its networks and registered a halt in the growth in network faults in FY16 after six consecutive years of increase. Global Services division has also helped in better monitoring of networks and IT applications. FY16 also saw BT launching BT Call Protect services free to all customers which would help to divert spam and nuisance calls to junk voicemail. The Consumer division upgraded its superfast broadband service from 38Mbps to 52Mbps to all customers where available. BT has also improved its “Right First Time” performance by 6.4% in FY16 compared to -3.0% in FY15 and has registered a cumulative improvement of 22.1% since 2010. 1. Development of 5G through strategic partnerships with Nokia and Huawei: British Telecom is collaborating with Nokia on the development of 5G. As a first step in the collaboration, Nokia has started conducting trials of its latest 5G ready radio equipment. BT also has entered into an research alliance with Huawei into ‘network splicing’ over 5G networks which will allow individual networks remain unaffected due to surge in bandwidths on network as a whole. Given that 5G will be able to deliver seamless connectivity better than any of today’s networks, including 4G, this is a huge opportunity. 2. Exclusive broadcasting rights to European football to help BT further expand its customer base: BT retaining the exclusive rights to European football for £1.18bn till 2021 will help it in developing its share of the retail triple-play and quad-play market segments. The deal will further help in bolstering BT’s Pay-TV business as it continues to fend off competition from Sky TV and Virgin Media, other major competitors in the UK’s DTH market. 3. Launch of new products and services capitalizing on synergy from EE acquisition: The previous year BT launched their new European football content. The launch of BT Mobile was also successful, adding 400,000 customers in just a year since its launch. The acquisition of EE in January allowed them to merge a large mobile network with a large broadband network. Apart from this, a number of cloud-based services and security products were launched for their business customers. The PESTLE/PESTEL analysis report for BT demonstrates the various challenges faced by BT in political, environmental, social, economic, technological, legal and environmental ecosystems. The external analysis of British Telecom essays in detail the significant factors which impact the macro-environment of the telecom industry for the leading global telecom major British Telecommunications. The setbacks in Italy have fueled BT to re-position and restructure the business for the future to strengthen governance, compliance and capabilities. The stripping of Openreach, one of BT's subsidiary by Ofcom has also major impacts on its micro and macro environments. This strategic decision to be fair and unbiased to consumers does stand to benefit BT's rivals in UK like Vodafone, Sky and TalkTalk. 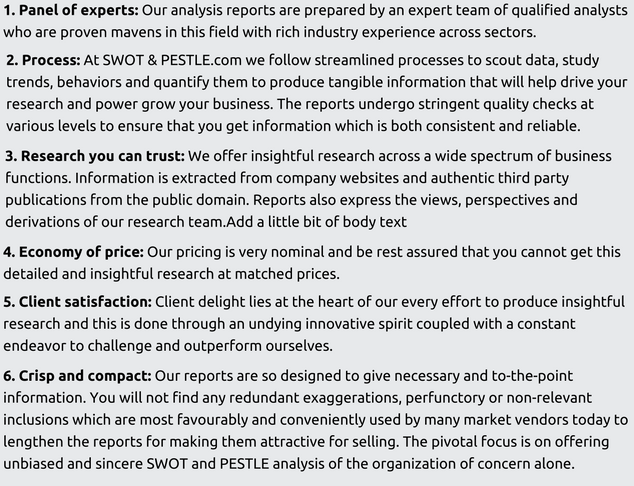 The analysis for the external environment of BT is presented in a matrix followed by the complete Pestle Analysis report. 1. Synergy from acquisition of EE: British Telecom acquired EE from Deutsche Telekom and Orange in 2015. The synergy from acquisition of EE will help BT in improved cost efficiencies and low churn rates through economies of scale. EE has a strong 4G mobile network infrastructure and the deal will allow BT to accelerate its mobility plans and allow it to invest appropriately with a future strategic plan. BT expects to save about £3bn after integration costs from the merger in a span of four years. 2. With increasing scope of services in the telecom industry, there will be further M&A opportunities: As the telecom industry expands its service spectrum, it is creating more merger and acquisition (M&A) opportunities for large players like BT. Smartphone penetration has reached a high of more than 80% in matured markets like U.S and Europe and companies cannot just rely on adding new customers to drive growth. Companies are looking to add untapped competencies which have the potential to deliver higher returns. The consolidation momentum in the telecom industry is set by the latest technological trends and with low interest rates, lenders are willing to underwrite large debts which favor M&A deals. BT has already acquired EE in 2015 in a large deal. Further opportunities for BT include acquisitions in areas such as M2M, cloud computing and micro services, big data analytics and Internet of Things (IoT). AT&T acquisition of DirecTV and Iliad’s deal with Telefonica are some other notable examples of consolidation in telecom industry in the past two years. 1. Investments in high speed network and alliances for 5G development: BT’s investment in high speed network and 5G technologies will help it to maintain a technological advantage. BT has pledged to invest £6bn on superfast broadband and 4G rollout and extend the high speed service coverage across UK by 2020. BT also has entered into a research alliance with Huawei into ‘network splicing’ over 5G networks which will allow individual networks to remain unaffected due to surge in bandwidths on network as a whole. Earlier in 2016, BT’s acquired company EE entered into a collaboration with U.S.-based Verizon, Australia's Telstra and Korea Telecom (KT) on enhancement and promotion of LTE Broadcast technology. 2. Capitalizing on ‘Cloud of clouds’ services: British Telecom can capitalize on ‘Cloud of clouds’ service offered by BT’s Global Services division which will help it achieve economies of scale. “Cloud of clouds” strategy helps organizations in bringing all its distinct and independent cloud services under one umbrella. It creates a single network which can connect to all the databases where the cloud applications are hosted. BT also has a number of applications running on diverse platforms and adopting the ‘Cloud of clouds’ strategy will help in application rationalization and optimize the IT systems for BT. Gain a good understanding of British telecom's internal analysis which include strengths and weaknesses. Gain and understanding of the micro and macro environmental factors. Major competitors and the threat they pose. 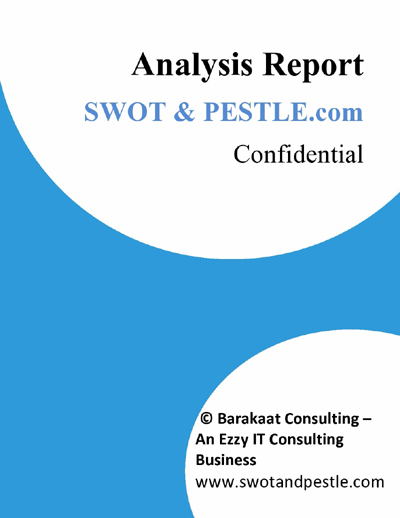 British Telecom SWOT analysis has been conducted by Aditi Chaturvedi and reviewed by senior analysts from Barakaat Consulting. 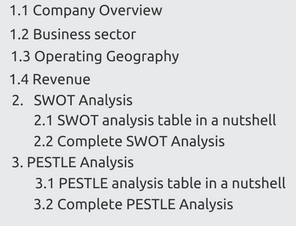 Copyright of British Telecom SWOT and PESTLE Analysis is the property of Barakaat Consulting. Please refer to the Terms and Conditions page for usage guidelines.